The summers had already started, it’s time to get a beautiful backyard swimming pool. You can add a number of water features when you remodel the backyard area. Discover the best swimming pool features that can spice up your swimming pool experience. Here is the endless list of fun features that you can enhance the look and feel of the swimming pool. What can soothe your soul more than a creative waterfall? Feel wild and free by adding a few natural stones to get the best out of it. Opt for a natural-stone waterfall made with stones, pebbles to make it look and feel more natural. You can ask the swimming pool contractors to design you natural-looking artificial stone waterfalls at an affordable price. 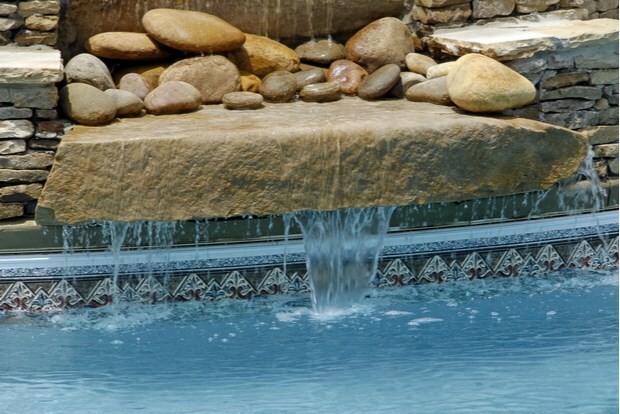 The waterfalls feature makes your pool visually pleasing than the standard ones. You can easily get this feature by asking your swimming pool contractor or landscape contractor to build a fountain bubblers like mini-geysers near shallow sun ledge. They can excite your kids with their fun element. They go well with all types of pool and are cost effective too. The water slides take you and your kids to the personal amusement park at your backyard. It is a timeless feature that can promise endless fun for both kids and adults. A water slide is an ultimate addition to any swimming pool type. Make sure you purchase the right size of the water slide that can match the requirements of your family. You can get a straight water slide or experiment some curvy slides for unlimited fun. It is advisable to opt for the water slide that is deep enough to land you into the water. It is mandatory to hire a professional to install any feature. Adding a hot tub near your swimming pool can help in improving health and wellness. It creates a spa-like feel and looks. It is generally referred to as Hydrotherapy, which involves three main healing ingredients that are heat, buoyancy, and massage. Let your nerves loose and unwind yourself to get rid of all the stresses. Get in touch with the best swimming pool contractors in the following cities to get a cool swimming pool at your backyard. Chennai, Bangalore, Delhi, Hyderabad, Mumbai, Ahmadabad, Kolkata, Pune.